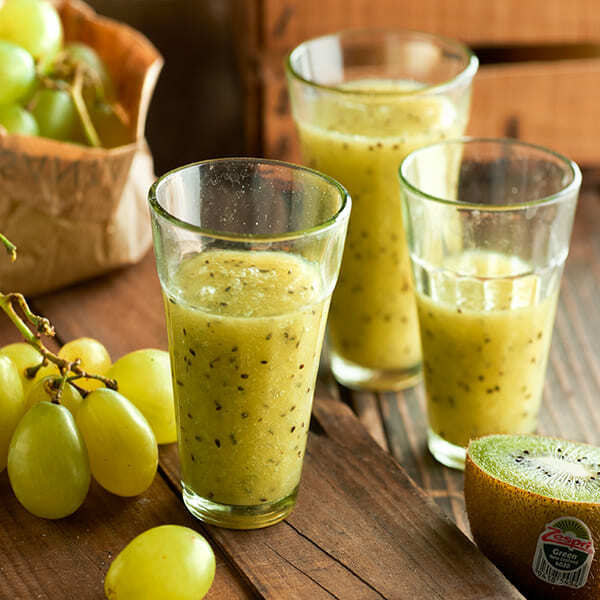 Zespri kiwifruit is the perfect ingredient in many highly nutritious recipes. Try this refreshing juice, for example. Ideal if your digestive system needs a helping hand. Recipe rich in fibre and high vitamin C content. Natural source of folate and a good source of potassium. Put the strained juice back in the blender with the kiwifruit and water and blend again. Tip: Important to strain the grape juice immediately as this improves the texture. What is the nutritional value of a Zespri kiwifruit? With more food choices than ever, deciding what goes in the shopping basket to keep yourself and your family healthy and happy is not always and easy task. One thing you can be sure of, however, is that fruit and vegetables are always a great choice.